Single sided two-tracker. 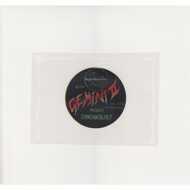 Gemini II present two jagged house tracks. Synths and samples clashing over wild drum programming. Handmade covers, individually painted. Colours vary per copy. Super super super limited.